How did I arrive at my version of each sutra? pranava - pra (“pre,” before) + nava, (roar or shout of joy). The primal sound of the universe continually and exuberantly singing itself into existence. Nava also means boat (to travel the ocean of infinity). OM for short. adi – beginning with, commencement. Adi also means “etcetera” and refers to the other pranavas. Vedic pranava is AUM; Shiva pranava is Hum; Shakti pranava is Hrim. samuccara - to go out together, to go upwards, ascend, rise (as the Sun), issue forth; utter, pronounce, to talk together. Ucchara is rising, the rising of pranava from verbal to subtle vibration - spandana - to spaciousness. plutante - pluta: “floating, swimming, bathing, submerged, protracted, flooded with, overflowing, prolonged, prolated or lengthened (as a vowel). Plu is also to navigate, and to vanish by degree. sunya - vacuum, emptiness. The radiant spaciousness. Heaven. bhavana - meditating, feeling, reflecting, contemplating, imagining, cultivating. (also, becoming, and passion, the 8 or 9 bhava-rasa pairs). sunyaya - by that sacred emptiness. paraya - by the transcendental, by the supreme. shaktya - shakti, divine power or energy. *definitions are from the Monier-Williams Sanskrit-English Dictionary, the usage of adi to refer to the pranavas is from Swami Lakshmanjoo’s teachings. The universe is an expanding shout of joy. hear it in the sounds of life all around you. In yoga, listen to the deep and blissful currents of life evolving itself. This is just one of the meanings of the mantra OM. - prana + va, the voice of prana. 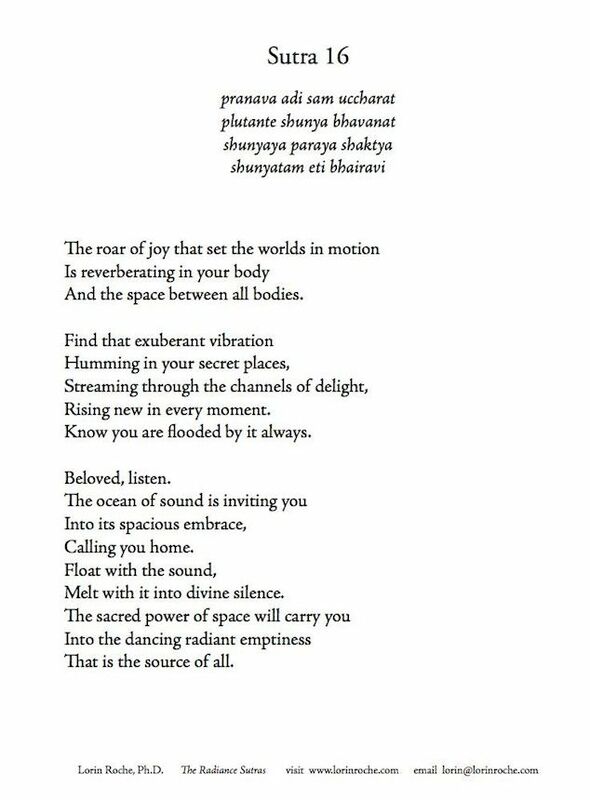 - Pranava, the breath of creation. These all make sense in terms of the dynamics of practice. In the mantra yoga tradition I was trained in, beginning in 1968, the teaching was to let the mantra arise fresh and sound different each time. Let it have its own rhythm, let it find its own level. Don’t do anything; Be with the mantra, and allow it to carry you beyond itself into the embrace of space. This is a very jazz-like approach, in which you let the shimmering power of space and silence play your body like an instrument . This feels like listening to music while getting a massage and floating in a hot tub. Pranava adi samuccara plutante all the way. Later, in the 70’s, when I started coaching other meditation teachers and advanced practitioners, I was amazed to discover that many of them did not get the memo about improvisation. There was no playfulness in their practice. They were diligently working at the mantra, trying to pronounce it clearly, and sort of boring a hole in their brain, and boring themselves to death. And wondering why their lives had become arid and their health was suffering. Depending on how you engage with pranava, the flow of prana in your body is shaped. The style with which you listen to the mantra shapes the vibratory relationship between your annamaya kosha (your physical body,) and your pranamaya kosha (your life force or body of prana.) If you improvise with the mantra, it will change continually, make up its own meter, and in so doing, become endlessly interesting. It will also tend to change itself into the perfect sound to balance your body energies in this exact moment, enhancing your health and joy. The mantra will be always rising fresh. The free flow of pranava strengthens the free flow of prana. One word of caution. If you use the mantra to block out thoughts, you may succeed – and as a result, lose track of where you are on the path of your life. If you use the mantra to dissolve desires, you might become passionless and lose your motivation. This might be just the ticket if you are a monk or nun, and have taken vows of obedience, poverty and celibacy, and cannot live your desires. But if you are not a nun or monk (clue: look down, are you wearing robes?) you need to stay in close touch with desire as your compass and motor. There is a lot more meaning encoded in the Sanskrit. My notes include 30 or so pages of versions of Sutra 16, using various definitions and associations of pranava suggested in the Upanishads and Tantras.